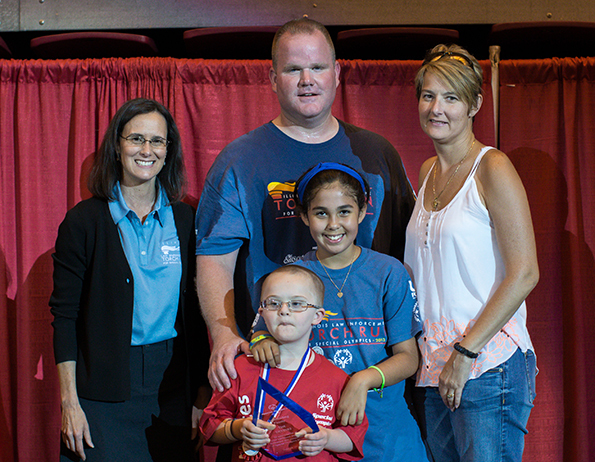 Bill, Nikki, Madison and CJ Devine of Tinley Park have been named 2013 Special Olympics Illinois Outstanding Family of the Year. They were honored at a reception held on June 14 before the Special Olympics Illinois Summer Games Opening Ceremonies at Illinois State University in Normal. Bill Devine is an officer with the Tinley Park Police Department and has been involved with Special Olympics and the Illinois Law Enforcement Torch Run (LETR) for 16 years. Bill is a Leg Leader for the Torch Run and sits on the State Torch Run Committee helping to put on the many statewide Torch Run events. In 2006, Bill and Nikki Devine’s son CJ was born with Down syndrome. CJ participates in the Special Olympics Young Athletes Program and is one of the most amazing Young Athletes that you will ever meet. Their daughter, Madison, is a peer buddy with CJ during Young Athletes events, encouraging him and the other athletes, rewarding them for a job well done. Bill and Nikki Devine are always trying to give the athletes the most opportunities they can to experience all aspects of life. Nikki has been instrumental in promoting the Young Athletes Program to others in the community and opened the eyes of many individuals to the world of Special Olympics Illinois. In addition, the fundraising efforts of their family have helped the organization raise hundreds of thousands of dollars. Bill has participated in the SUPER Plunge – where individuals plunge into the frigid waters of Lake Michigan once an hour, every hour, for 24 hours straight to raise funds for Special Olympics Illinois. In the past five years, he has raised over $50,000. Madison has even joined him the past few years.